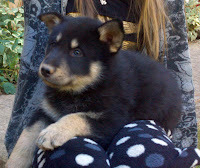 Shika's Hybrid Wolf Puppies For Sale: These puppies should be big. They are from large, high-content wolf dog parents. Mother is Shika - large, high-content Mackenzie Valley Wolf (click here for Shika's Blog) and Father is Titus - high-content, medium/large Timber Wolf (click here for Titus' Blog) Litter is CKC Registered. Shika is a high content Mackenzie Valley Wolf Dog, born on February 6, 2007. Her next litter of cubs will be her last. She is an extremely well socialized mother, who passes this on to all her wolf dog puppies. Although, Shika is not for sale, her puppies will be for sale. Take a look at her newest litter of wolf dog puppies for sale in the NEW! Puppies Page. Shika is CKC Registered. Titus is a very high content hybrid Timber Wolf. He is CKC Registered. SOLD! - Roxie - Female - Mackenzie Valley and Timber Wolf. CKC Registered. SOLD! 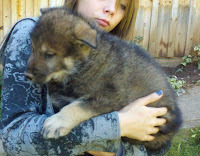 - Namaste - Female - Wolf Hybrid Puppy for sale Mackenzie Valley and Timber Wolf. CKC Registered. 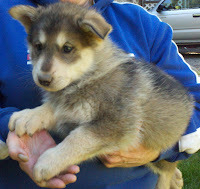 Kaylee - Female - Wolf Hybrid Puppy for sale Mackenzie Valley and Timber Wolf. CKC Registered. SOLD! 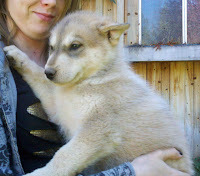 Anna - Female - Wolf Hybrid Puppy for sale Mackenzie Valley and Timber Wolf. CKC Registered. SOLD! 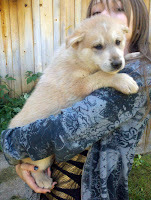 Twila - Female - Wolf Hybrid Puppy for sale Mackenzie Valley and Timber Wolf. CKC Registered. SOLD! 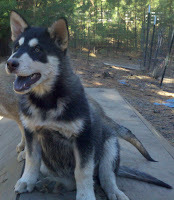 Buck - Male - Wolf Hybrid Puppy for sale Mackenzie Valley and Timber Wolf. CKC Registered. SOLD! 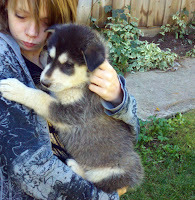 - Juno Junior - Male - Wolf Hybrid Puppy for sale Mackenzie Valley and Timber Wolf. CKC Registered. SOLD! 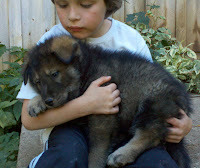 - Thor - Male - Wolf Hybrid Puppy for sale Mackenzie Valley and Timber Wolf. CKC Registered.